Netlist NVMe SSD excels in the demanding workloads of Data Center applications. The N1551 family of SSDs are NVM Express v1.3 compliant with up to 3 DWPDs (Drive Writes Per Day) for 5 years, low power and high performance up to 3.2GB/s read throughput. 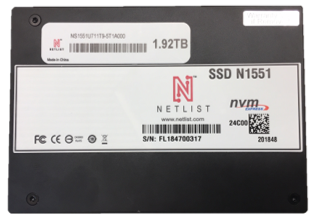 Netlist N1551 NVMe drives are optimized to surpass the needs of Data Center users.